Thanks to Orwell, 1984 is perhaps the most significant number related to dystopian fiction, a fact not lost on the developers of Tower 57, whose own take on a dystopian future was funded with the help of 1,984 Kickstarter backers. And threads of Orwell – as well as Ayn Rand and Jules Verne, credited as sources of inspiration for the setting – do seep through, even in a game that is more primarily focused on you enjoying an Abraham Lincoln-alike using a flamethrower to get through hordes of security robots. The tower of the title is a self-contained society of its own, complete with industry, poor and rich districts, and sewerage system – all of which you’ll spend some time blasting through. Initially you’re looking to investigate why the overseer of production has shut everything down, although the answers you get push the story ahead to tell more about the very world the tower is based in. Though as far as your investigation goes, it’s not exactly subtle. 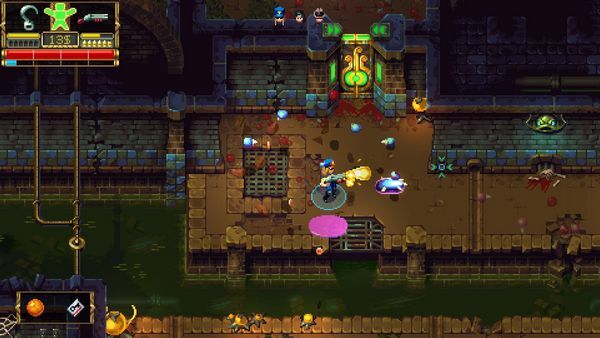 It’s a twin stick shooter, although the pace is slower than many – Tower 57 may share a control system with Smash TV, but it feels more like playing through dungeons in an early Zelda game. 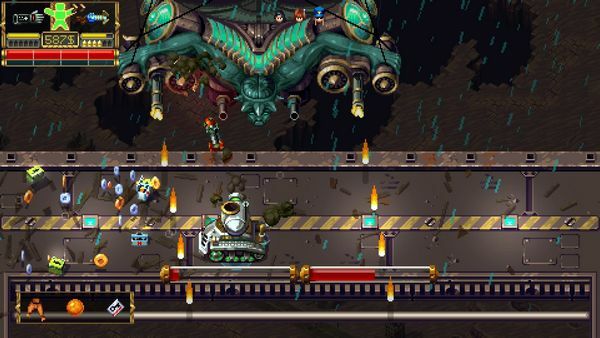 Progress through the areas tends to involve fighting room-to-room with slime monsters, mutants, and swarming robot defences, with progress barred until everything is destroyed, and some simple puzzles and occasional exploration to keep the environments feeling a bit fresher and more relevant to the story. You initially pick three archetypes from a pool of six, such as a cop, a scientist, or a gangster; all characters identified by their social role very much like the team selection of classic Amiga shooter The Chaos Engine, which may be one of the biggest influences on the game itself. Each character has a unique weapon, and may occasionally have extra dialogue choices when dealing with NPCs; the three also essentially count as your lives, with you able to swap between them if someone is injured, and a death cycling control onto the next character. 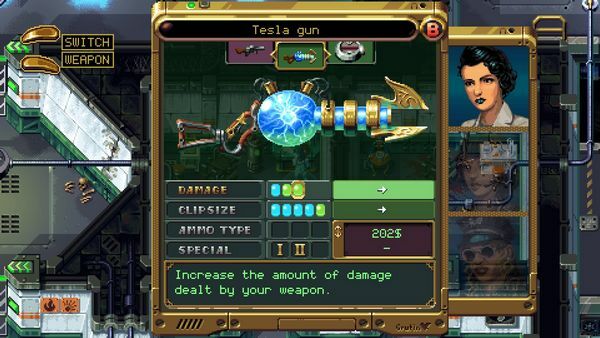 Each character does feel different to play, thanks to their personal weapons – though if they die, these weapons are dropped and another character can pick it up… which may be essential if you’ve been investing the money dropped by blasted critters and destroyed scenery into upgrading one character’s gun. You’re less in luck if you’ve been upgrading the character who died themselves though, at least until you reach a fortune teller while holding a piece of amber… it’s one of the fussier parts of the game design, and truth be told it was often easier to quit and reload if an upgraded character died, instead of pressing ahead with weaker team mates. Perhaps the greatest breaker of atmosphere is the hardest to get balanced though, with messages relating to the Kickstarter campaign and its backers littering the levels. Obviously, as one of the reward tiers there is an obligation to mark people who gave their backing, but the little messages and items to find inconsistently range from witty and contributing to the setting through to obscure or just duff. The nature of the game’s funding is treated like an inside joke, but it’s a joke that wears thin after repeated re-telling, and before long finding yet another message hidden away somewhere is less of the treat an Easter egg should be. It’s completely understandable why there was a need to add these little markers… but the novelty does wears off. While mentioning the levels, it’s notable how much better the later ones feel to the first couple. Between them having more enemies to keep interest high, some clever pathfinding to keep routes looping back on themselves without necessarily retreading old ground, arguably better background music, and how the weapons are generally more fun to use when upgraded, the later part of the game is significantly easier to praise than the beginning… and this makes the game worth keeping an eye on, as the developers themselves are promising an update which will rework the first level, hopefully to bring it more in line with the endgame. The later levels also have an interesting selection of bosses, which may prove to be quite a difficulty spike after the more easy-going levels (again, a reason why the later levels are more fun, with a higher challenge too). Generally, the bosses add to the setting quite well, and test just how good your upgrades and abilities are. One piece of advice: learn to dodge. 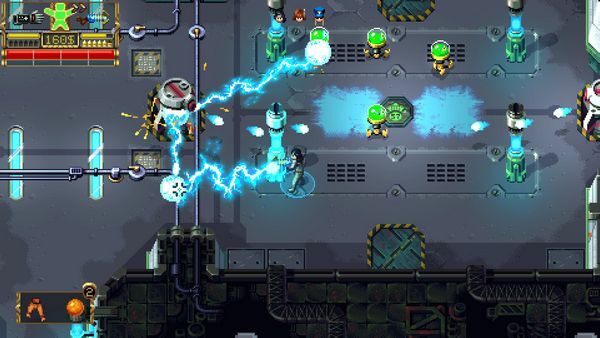 Overall, Tower 57′s approach mostly works – in many ways it carries the feel of early-90s 16 bit titles well, although run through a game engine that requires considerably more power to handle destroyable scenery, and the pathfinding of enemy swarms. It’s fun, though you’ll get more out of it if you approach it for the story and setting rather than as a pure shooter, because while it uses a twin-stick control system the pace of gameplay is generally slower than the more out-and-out shooters in the genre. It’s definitely looking to be more of an action-adventure, and the game runs at a pace that lets you still appreciate the details around you… though, strange as it may sound, there are just too many of them, comments and items scattered so generously through the levels that they’re in serious danger of detracting from the setting instead of adding to it.